This is a set of four wooden boxes with painted lids. Each contains knobless cylinders corresponding in size with the knobbed cylinders. The cylinders in each box are painted the same color as their lid. Made out of rubberwood (hardwood), these knobless cylinders are great for your home or school use. The knobless cylinders are stained and slightly lacquered. We will warranty this set for one year, and assure you that this set will not chip. If breakage or chipping occurs within one year of purchasing this product than we will send a replacement cylinder for the one that is damaged at our cost. 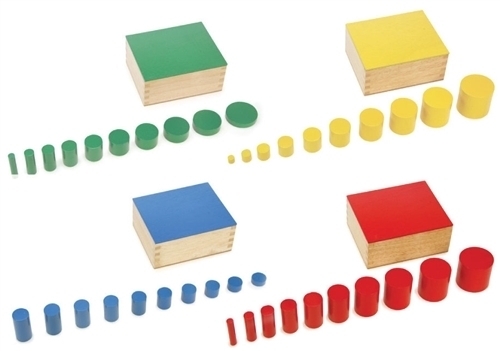 Havent used them yet but they look very nice and as I read elsewhere they fit perfectly into the knobbed cylinder blocks which is good for extension activities. The color coded boxes are wonderful.